A high neck sweater is a close-fitting high-collar cozy sweater. Extremely useful and versatile, this type of sweaters is very trendy during the latest years. Many women do not think that high neck sweaters are very cool. Well, this impression is not correct because it is up to you if you manage to find the best combos. High neck sweaters are pieces of outfit that can be included very easy into any type of wardrobe. They are extremely useful when the outside temperature forces you to wear layers. When that happens, you need a very versatile piece of clothing. 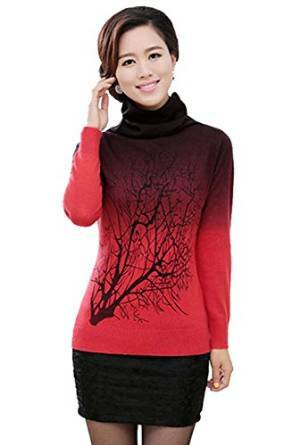 This type of sweater is extremely useful whether you are going to the job, to a picnic, having a walk or just going shopping. No matter your personal style, a high neck sweater can be a great option. Yes, exactly, this is an extremely important aspect because, as I was saying above, it does not matter if you enjoy the classic style or maybe a more relaxed style, such a sweater can be of great help. A high neck sweater is more than a simple piece of clothing. If you can find the right combo, it can be one of your favorite items from your wardrobe.